ESOTERIC RECORDINGS are pleased to announce the release of a newly remastered and expanded edition of the classic album “AIR WAVES” by GORDON GILTRAP. This product is released June 30 2014. For over forty years Gordon has enjoyed the well-deserved reputation as one of Britain’s greatest guitar players. He made his first recordings in the 1960s as folk artist, but by late 70s he had crossed into the Progressive Rock genre. A trio of albums on the Electric Records label earned Gordon much praise and an ever-increasing fan base. In 1979 he released the album “The Peacock Party” for PVK Records, (also re-released on Esoteric June 2014), a highly successful project. 1982’s “Airwaves” was his next album. The project started life as a library music album but the material was thought so strong that it was decided to expand the work enough to release commercially as the next album by the Gordon Giltrap Band. 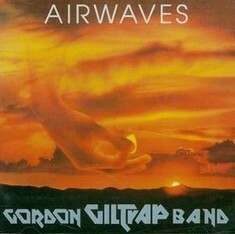 “AIRWAVES” saw Gordon backed by a band of outstanding musicians such as CHAS CRONK (Bass), ROD EDWARDS (keyboards), BIMBO ACOCK (saxophone & flute) and CLIVE BUNKER (drums) and featured many outstanding tracks. This project started life as a library album, but was thought strong enough to release commercially. It was first issued on PVK records in 1982, but it was decided because of the cohesive overall feel, to release it as a Gordon Giltrap Band album. The previous album, "The Peacock Party " ( LCVP105CD ) was very successful, so it made sense to continue in this vein. There is a cross section of styles on display here, from the almost funky feel of the title track, to typically Giltrap penned pieces like " Rainbells "and " Empty ". Elsewhere, Gordon straps on the electric guitar for the Dire Straits influenced " Sad Skies "," Heroes " and " Lost Love ". This Esoteric Recordings edition is newly remastered from the original tapes and includes four bonus tracks recorded for the original “Airwaves” library music project. The reissue also features an illustrated booklet with new essay and interview with Gordon Giltrap. 1982 PVK Label LP - GIL2 Tracks 1 - 12 as listed above.